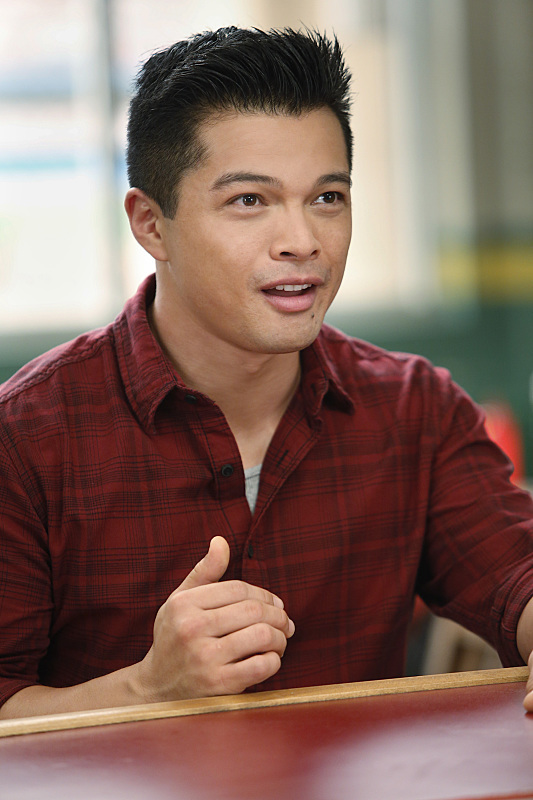 We aren’t supposed to play favorites, but Vincent Rodriguez III happens to be one of ours. We first caught up with him when he was a member of the cast of The Hunchback of Notre Dame, and incidentally, he just recorded the cast album for release in January. Now, he’s in one of the fall’s most exciting and critically-acclaimed shows, Crazy Ex-Girlfriend on the CW. How did your time on the stage prepare you for this role? The role does have singing required because the show is a musical, and there’s obviously some dancing in it. But a lot of my skills I accumulated for stage specifically, are being utilized for this show now. They are taking what I do and writing it in. It’s kinda crazy that I get to do things I’m used to doing on stage but do them on camera now. It’s different for TV in terms of energy and pace, but I think I was on the brink of being ready for it. It’s certainly a process I wasn’t used to but it’s a lot of fun. How has this journey been different than what you thought it would be? I think I was ready. Everything I’d done up to booking the job was preparation. There were lots of TV jobs I had auditioned for. While I was in Anything Goes on tour, I was auditioning, putting myself on tape, getting used to seeing myself on camera and hearing how I read. Now, I get to apply it all to this job. Once you’re on set, there’s a lot of waiting involved. You wait and then your part as an actor happens very quickly, so you’re pulling from all of your experience on stage about always being ready and then applying that to filming the TV show. Rachel Bloom is the star but she also writes the show and the songs. I do most of my scenes with her and we will do it as scripted, but since we get to improv, we will run it again and she’s saying words that I don’t recognize. We get to play and roll with it. It’s similar to how we play backstage in theatre and keep each other’s energy up. She writes songs that push the plot. It’s not like Glee being at Nationals or Smash being in rehearsals – this is all in her head. As her fantasy takes her away into the musicals, she starts to infect the rest of us and we all become included in that. You’ve had a lot of firsts. Press junkets, up-fronts, etc. What are you learning through all of this? I learned that when you’re acting, it’s not about doing exactly what’s required. A year or two ago, when I was on tour, I for some reason I had an idea to do a web series called On Tour With Vince and a producer picked it up and dropped it about six different times. I started to think: What if Broadway wasn’t the end? What if it wasn’t the end goal but was an aspiration leading to being successful across the board. Theatre has been what I’ve been focusing on while trying to get my feet wet in TV and film. With that in mind, I’ve thought about if I was interviewed, what would I say? If I went to an event, what would I wear? If you’re successful, what would do? That way, when I got there, I wouldn’t be so surprised. When I got here, I was ready to accept these new work circumstances and do this work. You don’t know what’s going to happen with the skillset you’re developing for yourself, so the attitude I had was that in everything I do, give 100 percent and treat every job I get like it’s the biggest job I’ve ever had. How did the move from a half hour show on cable to an hour-long network show help the show? We already had a funny show. I saw the original pilot and it was a little darker and with adult content since it was Showtime. But what’s great about Rachel is that when the CW wanted to explore it, the only thing they changed beyond length is that they toned down the adult content and removed the profanity. What’s happened as a result is something very funny. We are laying it out there, but we don’t have to overtly say it because the audience will totally get it. Society is full of slang and we can play with that. On significant variation from when we switched was the deeper emotional depth in relationships within each of our characters. We go deeper into who these characters are. They became real, very lovable and likeable people. America will be able to identify the people in this town and see the humor in who we are creating with these people. It makes the episodes more powerful. I gush about her all the time because she’s really an amazing person who has created something so unique, authentic and awesome, but Rachel is depicting the awkward moments of life. Just in the title “Crazy Ex-Girlfriend,” she’s commenting on what it means to be crazy. As the show goes on, the audience will see that ‘girlfriend’ is interchangeable with all the characters in the show. What can we look forward to during this first season of Crazy Ex-Girlfriend? I think you’ll be surprised by how a one-hour musical comedy can work on TV and you can take a sketch comedy vibe and musical theatre elements and see what happens. It’s so new and fresh and it keeps you on your toes. It’s really cleverly written. We have a strong team of writers and they push it with every draft. It’s pretty remarkable what they come up with in these situations that are based in truth. It’s musical comedy awesomeness. Almost all of the regular characters sing and dance and I think the audience is going to be surprised at how we get into the songs and what exactly we will be singing. Rachel has a style of comedy you can see in her YouTube videos and she really brings it home. If Family Guy and Southpark and SNL had a baby, it would be Crazy Ex-Girlfriend. It’s cool and new combination of all these awesome things we’ve been enjoying over the past few years.